Hi guys, after a small break You & Me sewing series is back. I hope you are enjoying it as much as I do! Today I welcome Abby from Things for Boys. 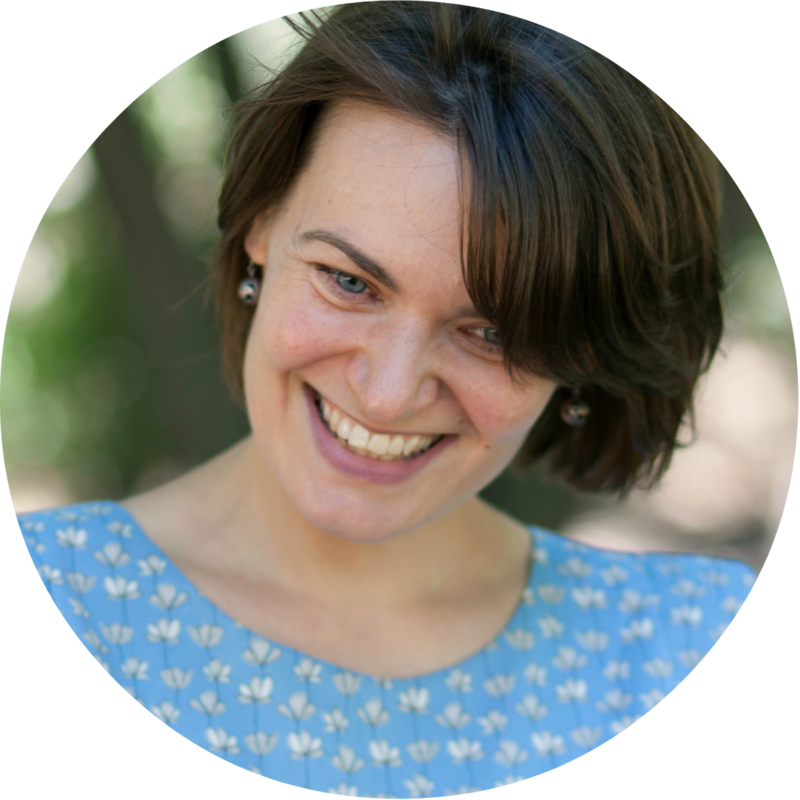 Abby is one the ladies behind the Fashion Revolution Day. A few months ago I saw Abby's Big T Nursing Top in one of the blogging groups on Facebook, and stopped to have a look. Boy I am glad I did! Abby is insanely talented. She sews, she cooks, she crafts! I have already mention that people that make jeans are heroes in my eyes. Check out these Small Fry Skinny Jeans Abby recently made for one of her sons! These board shorts are so cute. How about this boy version of the Cupcake Top? Abby also makes gorgeous things for herself. I love this colourful tee and Abby's Laurel Top, but I was speechless (which does not happen often) when I saw a leather bag Abby made for herself. Please visit Abby's blog for sewing inspiration for boys, tutorials, sewing techniques and more! Hi everyone! I'm Abby from Things for Boys. If you haven't come across my blog before, I write about the things I make for my boys - the hubby, and my two sons Roman and Ted. I love to sew, knit and bake and will get into anything creative given the chance. You can take a look at my recipes here, tutorials here and my sewing techniques library here. When Jenya emailed me about sewing for this series, I knew right away what I wanted to make. Roman loves to cook with me and when I'm making anything in the kitchen, he always asks 'Can I help you with anything Mum?' So cute! He even likes to put my tea bag in my tea cup. If I'm wearing an apron around the house he says 'You're a chef Mum', and it's cute to now have a mini chef by my side. Roman's apron is a white cotton homespun and has a nice big pocket on the front for storing all kinds of things. One of his favourite jobs is sitting on the bench and stirring the pans for me. 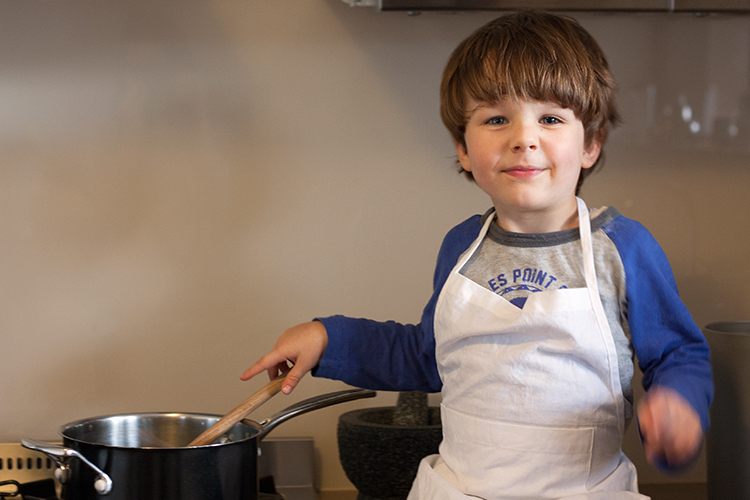 He also loves adding ingredients to the mixing bowl and picking spices from the pantry. He's actually getting very good at recognising them. 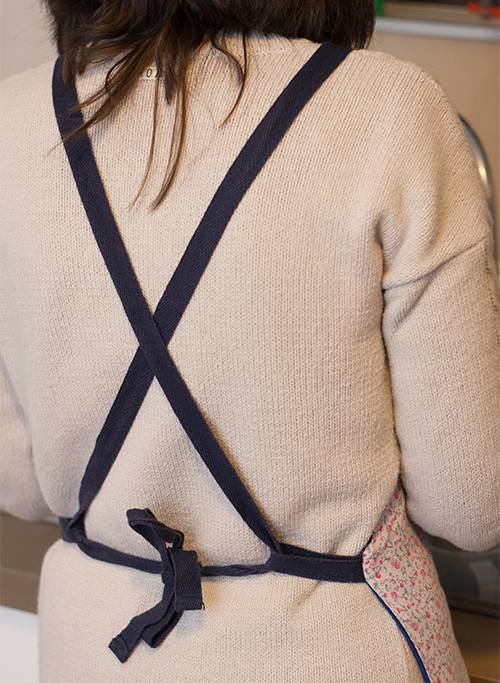 If you're after a good free pattern for a kids apron, then I love this one from The Purl Bee. I made a more girly apron for myself. This cute print was from an old tshirt. I accidentally ripped a hole in the back of it and was so sad, I really loved it! It looks great on the apron though and always makes me smile. The floral is a cotton print and I used a navy blue cotton drill for the back. The double layer makes it durable and gives your clothes extra protection against spills. My apron has cross over straps that go through loops attached to each side. I find the usual strap around the back of the neck can be annoying and usually too long, so this is the perfect solution. If you'd like to see more from me, then follow me on Instagram, the Facebook page or sign up to my monthly newsletter. Thanks for having me Jenya and I can't wait to see what everyone else makes for the series. Thank you Abby and Roman for sharing with us today! 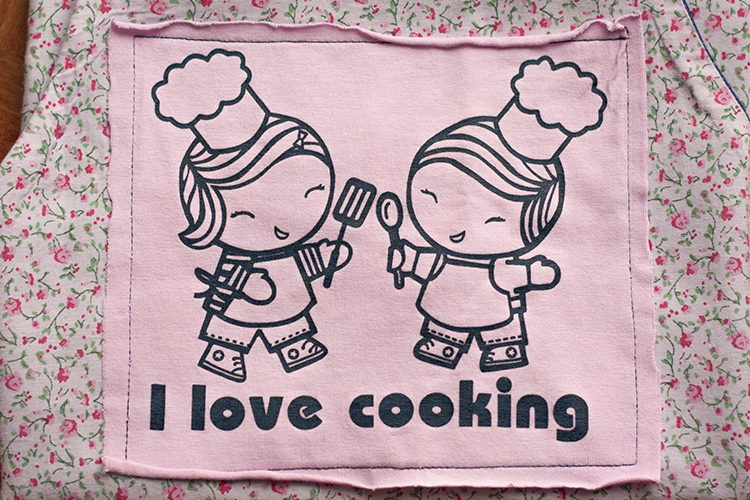 Your new aprons look super cute and it certainly sounds like you both have fun cooking and baking! What a wonderful activity to share with the kids (especially when they help clean up afterwards). Dear readers, if you would like to join in with us please feel free to upload your creations in the You & Me Flickr group. I would love to hear from you! Cute! I love the way that apron ties in the back. So cute Abby!! You must have great patience, I'm struggling to allow my 3 year old help me in the kitchen.. as it usually involves spilling the ingredients all over my computer (where i get most of the recipes).. perhaps this can be my next parenting goal, to allow help with cooking.. So cute Abby - and in the same theme as what I was thinking if I join in. Love that you used that cute top. Was totally worth saving. So cute! I love your apron! Aww that's so cute. I'm all for boys learning ow to cook (and clean) in the kitchen!